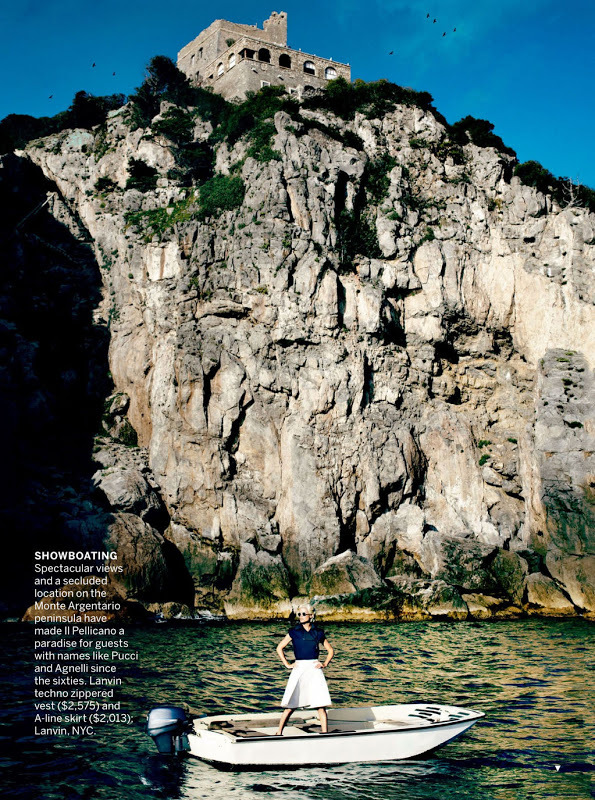 American Vogue escapes the Winter blues with a sun-drenched editorial starring supermodel Carolyn Murphy shot by Mario Testino along the Tuscan Coast. Murphy appears alongside actor Matthias Schoenaerts sporting graphic black and white ensembles and a newly shorn peroxide blonde hairstyle perfect for a seaside getaway. The American Vogue editorial caps off a stellar comeback by Murphy which includes multiple editorial appearances in V Magazine, Vogue Italia, and German Vogue, as well as that show stealing turn on the runway at Jason Wu during the Spring/Summer 2012 collections. Murphy is evidently in the prime of her life as she dons bathing suits, thigh grazing skirts and resort attire while showing no signs of shying from modelling's glaring spotlight. As much as I adore this editorial and the womanly allure that Murphy exudes, it is ironic that the powers that be have opted to air brush Murphy's naturally lined face in certain images to the extent that she no longer resembles the thirty-nine year old woman that she is.